Learning to become a tight arse traveller, meandering slowly and smelling the roses, is akin to starting your own offshore tax haven. Don’t let that fool you. The fact is you may never earn enough money to pay tax. But so what? Eat your heart out, here’s my office. This is my second home, a bonus of creative accounting. It’s rent free so I have nothing to hide from the taxman. This a drone shot, not mine, I pinched it from a friend. These days I’m learning a perverse logic: You may as well not earn money at doing something you enjoy than not earn money doing something you don’t enjoy. Think about it! I’ve never been mean, especially when it comes to spending Other People’s Money. Now, in the world of media’s changing economics and OPM vapourising, I’m learning to become lean and mean; a tight arse traveller. It takes practice but sooner or later unique creative accounting falls into place. Not only that but it’s possible to earn a comfortable living. For example I don’t measure my economy in dollars and cents, rial, roubles, rupiah, kip or kyat, even though my best friend is a free currency converting App on the iPad. My economy is measured in units of air fares and the cost of beer. There is no App for that yet. One Air Fare Unit (AFU) is $250. A Unit of Beer (BU) is one dollar. The process started in late 2008 when a global recession scattered freelance journalists and photojournalists in all directions. I was at a career point where I wanted to slow down a little. It was time for a change. I found myself disliking driving. I’d been down the road of exotic cars, luxury appartments and had a trophy wife. I ‘let her go’ and she quickly married a Gucci. That has become the basis for a bigger story. I’m working on that. Driving had been a passion but with crowded roads and traffic lights it had become frustrating. I was calculating how much I could sell my car for when somebody kindly drove theirs into the side of mine. The other driver should have become my new best friend. I would have bought him a few beers and traded girl friends because my car was deemed a write off and the insurers paid me twice what my asking price was going to be had I sold it. Suddenly I fell in love with an insurance company, that was a first, they can be very unlovable. Within a week the money was in a new account marked ‘Travel’. I woke to a new freedom, a new style of living. I had an old bike and a worn out travel bag which, at a squeeze, could accommodate a few T-shirts, shorts, jocks, toothbrush, shaving gear and pain killers. This kit was the framework for lightweight travel and a reasonable income. The economic benefit was instant. No fuel bills, no massive service fees, no new tyres, no broken screens, no break-ins, no parking tickets, no speeding fines, no road tax, no depreciation, no insurance and no drink driving problems. That doesn’t mean no drinking. Collectively they save me a minimum of about $6000 a year. I axed two daily newspapers, weekend papers and a few magazines saving another $2000 a year. My travel budget was now sitting on $8000 a year. Not a lot in the overall scheme of things but sufficient. I had been travelling on OPM, staying in decent hotels, sometimes in exotic locations. I had every so often flown first class (nice); more often business class (nearly as nice) and sometimes cattle class; not nice at all but I liked the passengers a great deal more. I had spent years in Fleet Street, a nerve centre of journalism in those days, and was on the staff of a French magazine. After several years I went freelance, working on assignments, earning well, saving little but enjoying the freedom only a freelance journalist can enjoy. I then started working on a totally speculative basis, writing and illustrating self assigned stories. My publication rate was high and I enjoyed more independence. I’m an avid reader of Graham Green, Somerset Maugham and others who travelled and wrote about the region. 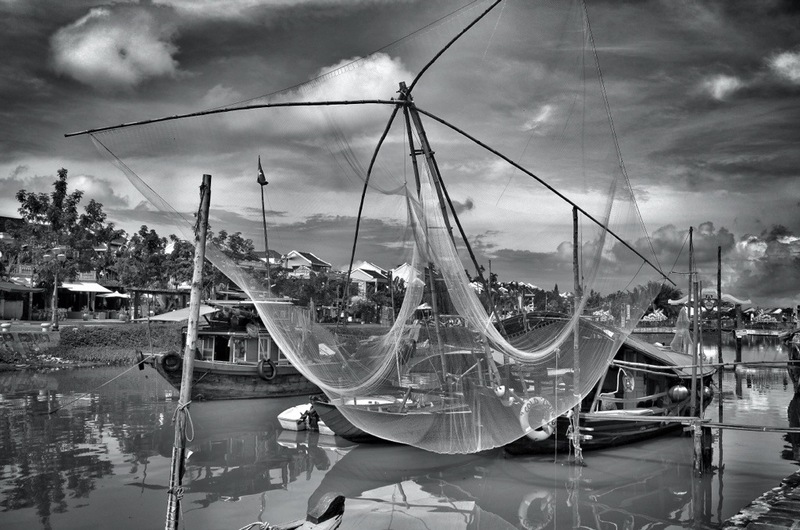 Prompted by their influences I have let myself loose in SE Asia, an old territory of colonial France, Indochina. I saw a refreshed career as what the French fondly refer to as a flâneur; simply wandering streets and observing life, making a few notes, taking a few photographs. I disciplined myself to write most evenings for an hour or so, usually in the company of ice cold beer and a local meal. A sea level view of the office. My spot is on the extreme right, in that dark space. As it happens Bali is only about three and a half hours by air from my Australian base so I made the island a second home. I can travel door to door, home to home, in about seven hours for one AFU. Once there I stay in a delightful, clean and comfortable hotel. It has eight rooms and costs me ten bucks, about 10BUs, a night including breakfast and, importantly, a fast internet connection. Adding to the romance of the place is the rumour that it was formerly a brothel. I find that hard to believe as it has cold showers which could be counterproductive in some situations. I can live for about $200 a week on the island, including the hotel. That’s less than one AFU. People don’t believe me when I say I’m heading off to Bali to work. “Enjoy your holiday” they say. My office is a beach where I write in a warung, eat fresh fish daily with salads, rice and fruit and have a beer or two at about a dollar a bottle. That’s only 2BUs v 18BUs minimum in Australia. I go to the morning market, buy fruit and chat to the locals who’ve named me ‘Poppa’, which I rather like. I buy fish to feed the hotel’s scrawny cats and frequently a kilo of rambutan when in season but the market is always full of fresh fruits. The fruit costs me about dollar, the fish about 20cents. In my local store, in Australia, rambutan is nearly $50 a kilo! Five kilos is an air fare! The more I eat the more I save. Erna and Made in their beachfront warung which doubles as my office. A decent lunch sets me back about 4BU of my creative travel currency. I do a bit of writing, walk about twelve lengths of the beach, swim. There’s a secret trail though the trees along cliff top to the beach . It takes me about ten minutes to walk to the ‘office’. I’m digressing. This blog is aimed at people looking for an uncomplicated life, smelling the roses and earning a quid doing something they enjoy doing. So back to the travel light and write theme. Having spent several decades covering news and other events I was ready for a change. I have always written, always taken pictures. It was a useful combination and I see no reason to change that. This change in direction is to look at laid back stories, probably around travel, people I meet, food I eat. Like any good flâneur I have no sense of direction. I do have a list of ideas which tend to revolve around rivers, lakes, oceans, boats, beaches and palm trees. And a Happy Hour in a bar somewhere. So please feel free to watch this space. This is my basic working kit. I sometimes take a Macbook Air but generally find the basic iPad is sufficient. I carry a notebook and prefer the French Clairfontaine products as the paper is extraordinarily good for writing on. I used to use Moleskine but the paper is not in the same league and they cost nearly three times as much – about 33BUs against 12BUs. I like to write with a fountain pen and Clarefontaine paper doesn’t suffer from ‘show through’. Ink is often not practical in climates of high humidity either as the paper can get a little damp from sweaty hands. In that instance I use a highly treasured ball point pen. A few pencils and a sharpener are handy backups. Basic writing kit: I use the notebook as a scrap book too. On the left hand page I paste useful things like maps, menus, beer labels. Anything which may jog a memory. On the facing page I make notes. Each page is dated. The iPad and notebook are stored in lightweight nylon bag. Not totally waterproof but it could help. Pens, pencils, sharpeners are in a waterproof roll-up pouch. I’ll write about a photography kit in the next blog. Cheers for now. The past few months have been the beginning of a watershed. A slight change of life style and direction. Only slight of course, I don’t like drama. I have been living in Fremantle, Australia, for close to 40 years. Those years have been great fun, sometimes profitable and sometimes a touch irritating when it comes to glancing at the pile of bills alongside the bank statement. I imagine a few people experience that feeling. I’ve pretty much covered Australia from top to bottom and side to side. Produced a number of books and written umpteen articles about everything from mining, agriculture, prospecting, cattle rustling, rodeos, fishing, pearling, diamonds … it goes on. Now, with massive changes in the media resulting from new technology, great changes in photography for similar reasons and changes in my mind for no particular reasons, I have made a decision to take a sideways shift in lifestyle. Fremantle is a little over three hours flying time from Bali, a place I enjoy for it’s laid back lifestyle, peaceful culture and charm. Thus I thought “Why not work from Bali?” It costs very little to live here in reasonable comfort and it is a convenient point to reach pretty well anywhere in Asia. So now I’m spending a few weeks here looking for a suitable place with two or three bedrooms, a swimming pool and space for an office. Thus I can live a ‘fly in fly out’ lifestyle and friends are welcome to drop in when they wish. The idea is to carry on doing what I do, produce a few more books of one sort or another, write a few articles and not make any rigid rules. I don’t do stress. I’ve also made a commitment to shoot more film, black and white, as well as the digital colour necessary for articles. More on that later but I have bought myself a rather indulgent Christmas present. I’ll show and tell in a later post, probably mid January. Here’s the view from what I refer to as my ‘Lunch Office’. I also have a ‘Coffee Office’ and a little further down the road a ‘Beer Office’. I confess that I do enjoy taking snaps on my iPad. This was a straight shot which went through a sort of random button pressing process on the Snapseed App which is far more entertaining than any computer games. Actually this is the last part of a blog I started a few days ago. I had to divide it into three sections as I was having problems. I’ve also added a bit. A few weeks ago I was holding a workshop at the Ballarat Foto Biennale. I was fairly happy with the way the workshop operated and particularly happy to have been at the festival. Being able to view the work of a lot of talent is inspiring and every time I go to a festival I find a little bit of inspiration rubs off and sticks. Apart from that I caught up with many friends I hadn’t seen for years. I’ll come back to that in a later blog. As it happens I’m in Vietnam in blistering heat and humidity and loving it. I’m getting a swag of pictures and a few of them I’m very happy with – I haven’t shown them here yet but will wait until I get a proper edit finished. I also get a bit of entertainment with them, playing around with the baby brother of Silver Efex – Snapseed, a great App for the iPad and a lot more fun than computer games. I’ve included a few pictures, more or less at random, in the blog. I’ve played around with them a little and will try and get a few more off in a couple of days. A couple are shown here, before and after versions. I’m a fairly judicious shooter, having been trained on 4×5 sheet film and roll film. I also edit in the camera during a coffee break, simply deleting the junk (and there can be a fair amount). Then, at the end of a day, I sit and download a few of the better pictures on to the iPad. I also get a bit of entertainment with them, playing around with the baby brother of Silver Efex – Snapseed, a great App and a lot more fun than computer games. I’ve included a few pictures, more or less at random, in the blog. I’ve played around with them a little and will try and get a few more off in a couple of days. A couple are shown here, the before and after versions. I explained previously that I’m shooting with the Leica X2. I have the camera ‘de-tuned’ as I call it. It has been set on ‘Low Contrast’, ‘Low Saturation’ and the lowest sharpening. When shooting with film, especially in contrasts light, it is a battle to retain a full dynamic range between the highlights and shadows. As a general rule it’s easier to print contrast up rather than cut it back. I find the same applies when shooting digitally. Thus I find the X2 delivers a very nice working jpg in most situations. Sometimes I like to help it along. 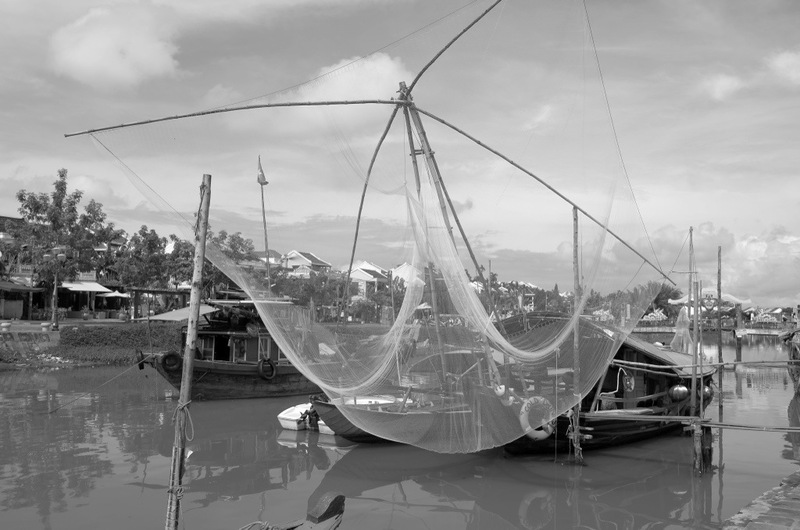 This picture was taken a few day ago at Hoi An. It’s a bit of tourist trap but the great pleasure is that all traffic, other than push bikes, is banned from the old city’s streets. This shot is taken along the river and I have to confess it’s a bit of theme park, the sort of place I avoid, but it’s done well. Then, for the hell of it, I tried the image in Snapseed, just using the ‘dynamic’ feature. The result was surprising and I felt: ‘Huh! Couldn’t, really have done better in the darkroom’. I’m inclined to feel it is a little bit overworked but I can live with that. Here’s another original followed by the the dynamited version. Finally, a picture taken on the other side of town, out of theme park. This has also had the Dynamic button applied. And in case you hadn’t guessed I admit to playing around with the borders a bit. So long for now. It’s about beer o’clock. I’m cursing myself. I suppose I’m allowed a few moments of stupidity but sometimes I really wonder if I should spend my time simply being content with a good book and a bottle of wine and never being let out alone. A few months ago I decided that the iPad, good though it is as a travelling companion, it really doesn’t have enough grunt for serious work as in editing pictures, writing text and, in particular, blogging. Thus I bought myself a MacBook Air and immediately fell in lust with it. It’s fast, has an excellent keyboard and all the whistles and bells. I’ve got LightRoom and Silver Efex Pro loaded as well as a few other goodies which form a perfect combination. So what did I do when I left on this trip? I decided to leave the Air and take the iPad, purely on the basis of saving a bit of weight. It quickly proved to be an error, though not a life-threatening one. I found it almost impossible to work WorkPress properly on the iPad so am at this moment trying a small experiment. That’s to say I’m writing this blog in Pages, an excellent little word processing programme in App form. Hopefully I can drop a few pictures in. We’ll see. It seems to be very ‘clunky’ so the plan will be to post little and often. The following shot was pretty much the first cab off the rank. 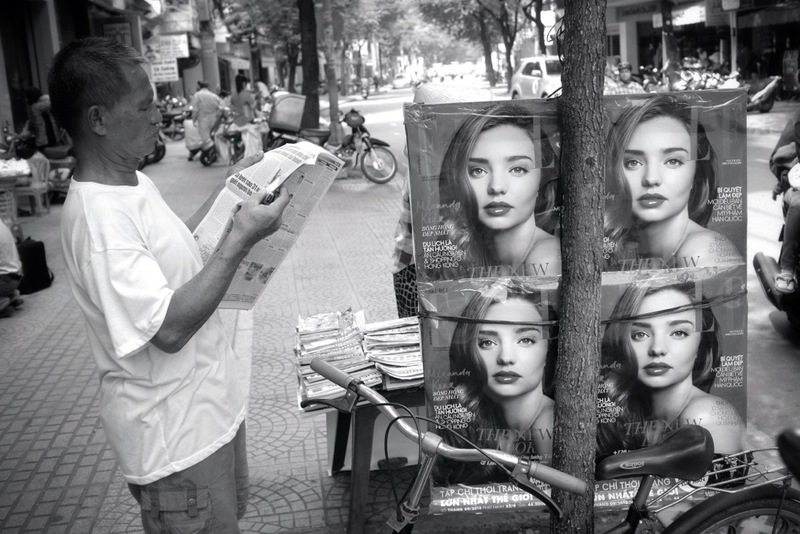 I have a peripheral project which is to photograph people reading newspapers. Sadly they are a diminishing breed. Well, not exactly on the road. Up in the air would be a better description and that probably describes my state of mind better than the mode of transport. In the past six or seven days I crossed Australia three times in the space of 20 hours, largely as a result of bad weather forcing the return of a flight from Melbourne to Perth with the added problem of waiting about ten hours for another flight. This resulted in a door to door trip of 36 hours and no sleep in that time. But I satisfy myself with the thought that if that should be the worst thing to happen to happen to me when I fly I’ll be a very happy wombat. Now, to add insult to injury, I’m stuck in Changi Airport, Singapore, after an overnight flight and waiting fourteen hours for a connection to Saigon. How do airlines manage these schedules – or mismanage them? Small wonder my favourite means of transport is foot power. Nevertheless this is not a bad place to be stuck. The shopping area in the transit lounge is bigger than my home town and there’s a strong temptation to top up with watches costing about fifty thousand bucks each as well getting a designer wardrobe. As it transpires the only thing I really wanted wasn’t available anywhere – a case to hold SD cards. I did manage to get one decent shot in Melbourne, or a least a shot I liked, whilst wandering around with an old photo mate, Michael Coyne. A group of artists were sitting around the steps of a grand building so I snapped them. Then, a few days later, I went for a wander to a local football ground where kids practice and parents watch and jagged another shot. I particularly liked this and it once again reminded me of the influences great photographers have on us. This time Lisette Model. New Project Right now I’m en route to start work on a larger project which, for starters, will take me up the coast of Vietnam from Saigon, or HCMC as the official name of Ho Chi Min city has been short formed, up to Hanoi. I’m keeping the principle story under wraps as I expect it to take several trips through SE Asia over about three years but, along the way, I hope to pick up many smaller stories. Ultimately I think there will be a book in it. I think I’ll leave this post for the moment. I’m working on my iPad and this is the first time I’ve worked in WordPress with it. I’ll see what mistakes I make first and then carry on with a summary of what I was doing at the Ballarat Photography Festival. Briefly it was a workshop on combining writing with photography to create feature stories and finding ways to make photojournalism viable in the digital age. Total Bogan Apart from that I don’t feel like doing a lot more writing. I had no sleep on the plane last night and was crammed in next to a total bogan, complete with baseball cap worn back to front and using a neck rest decorated in the style of an Australian flag. I don’t know why he bothered with it as he had no neck – it would have been impossible to hang him! 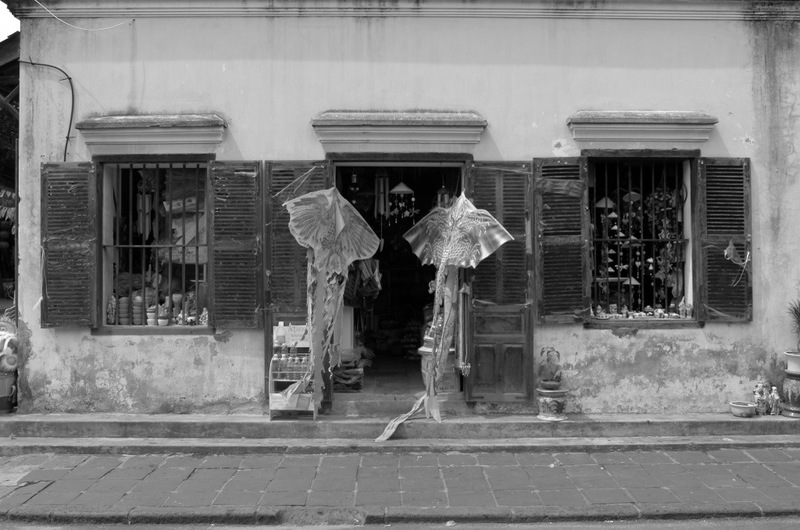 Bali Part II – Making a Plan – Who am I Kidding? And so I made a plan. I’d spend five days in Padang Bai, then slip over to my favourite hotel in Candidasa where they have an excellent restaurant with a French influence and a brand new pool to frolic around in and finally round off the trip with a few days in Ahmed. So much for the best laid plans. Anyway, this was a working trip and I had to work out a routine of some sort. One view from the $9 a night hotel. 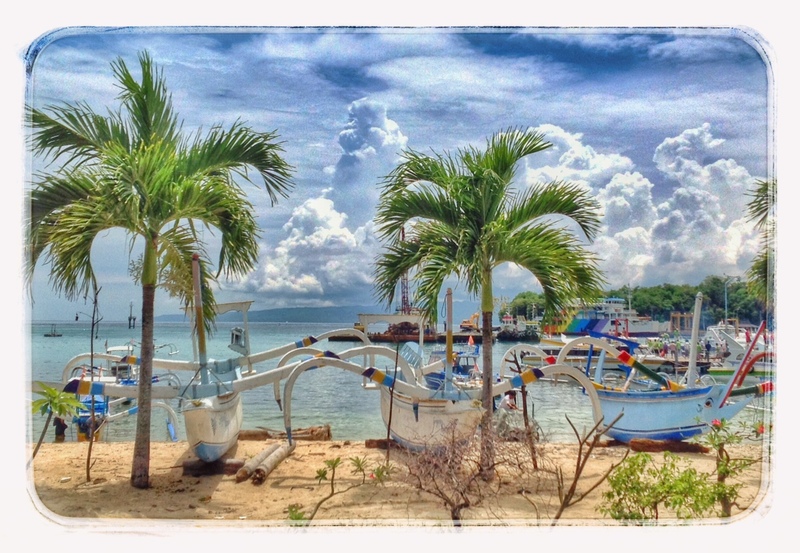 On my first morning I thought I’d gather my thoughts by heading off to White Beach with my notes and iPad. 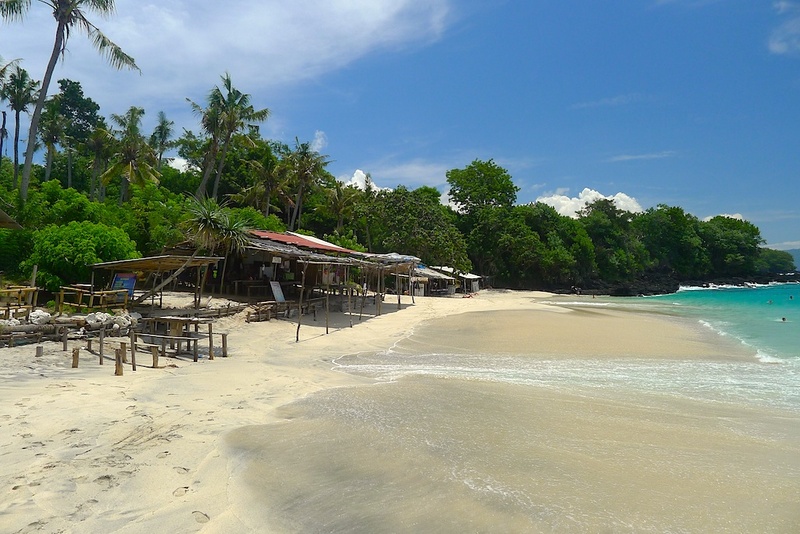 There’s a beach at one end of the town – White Beach. If you read the Lonely Planet guide it’s a short walk. Thus I cheerfully set off. It was a hot tropical day – humid with air like close-fitting velvet. I was told the beach was a gentle meander over the hill, a stroll past the temple ” … take about half an hour … you can’t miss it”. I’ve heard that phrase a good many times in Australia and greeted it with a sinking feeling. I’m the bloke who always misses the bright red oil drum marking the beginning of the dirt tract. Can anybody explain to me how it is possible to get lost on a single track lane who’s only destination is a beach? Black Beach or White Beach? It was simple as far as the temple which is just beyond the harbour’s ferry terminal. The hill then became somewhat more inclined, to the ‘short of breath’ status. After going down the other side of the hill I came to a junction. Nobody had mentioned that. The left side went up, the right side went down. Logic told me the beach must be down so I turned right. Wrong! I could hear water on a beach but it wasn’t getting closer. I stopped a guy on a motor bike which had a huge pile of hay on board, holding him in place: “Excuse me my good man, would you be kind enough to tell me the way to the beach please?” I said in my best and clearest English. “Black beach or white beach?” he asked in perfect Indonesian. “Er, white please my good chap”. He indicated the direction I had come from, told me to go to the top of the hill, I’d see a big green gate, ignore that, go to the road at the left and look for a pathway. “About 25 minutes”. White Beach. Tarzan and Jane would have loved it. Especially with an ice cold coke. Dehydrated and close to death I retraced my steps, found the gate, ignored it, found a network of paths and took several wrong ones, all within earshot of surf. I finally found some steps which led through unremitting undergrowth and trees. Suddenly there it was. White beach. I felt like Tarzan, in one of those films we used to watch as kids, suddenly seeing water for the first time. I grabbed the last creeper and swung down onto the soft sand and staggered up to one of half a dozen bamboo and tin warung, each with rickety tables and bench seats sitting unsteadily in the sand. I sat in the shade and ordered a Coke which came ice-cold in an old-fashioned bottle, the sort Tarzan would have been familiar with in Hollywood.The ocean was azure, palm trees dutifully did their postcard bit behind the huts and a few people plunged into the water. They were mostly of the eye candy version which gladdened my heart, making the journey worthwhile. It had only taken close to an hour and half to get here? I made camp and settled down at the least busy table, planning to read and write a bit but allowing myself the occasional distraction. A grasshopper, massive bugger, lodged at the end of my table and was slowly rocking backwards and forwards. I looked a bit closer and there were two of them … shagging themselves silly. I didn’t want to disturb them so let them get on with it. 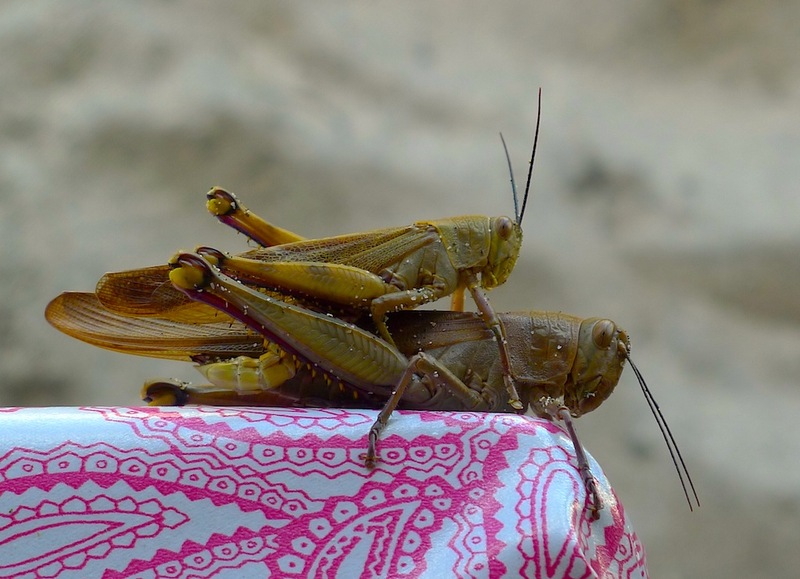 Shagging grasshoppers. You can’t get away with that sort of behaviour here. It didn’t take long before there was spontaneous outbreak of yoga on the beach. Not organised, just individuals. Having spent a day looking at ogahs (more about them in the next posting) in various stages of distortion and licentious behaviour I saw no reason not to enjoy what was happening. Women started contorting themselves on the beach in a manner they wouldn’t dream of doing at home, in front of menfolk. In any event they would have been hosed down with cold water. Downward Dog was pretty easy to spot but there were interesting variations. Scratching Panda, Itching Monkey … how do you describe such things? Thank goodness they hadn’t seen Shagging Grasshopper. One tender morsel, trim, taut, terrific (and knowing it ) stood up, all but naked and covered in damp sand which was sticking like Lycra, where it touched, which was almost everywhere. She skipped to the water’s edge with one of those dainty little hopping dances which fitted a ‘look at me, look at me’ rhythm. So I did. 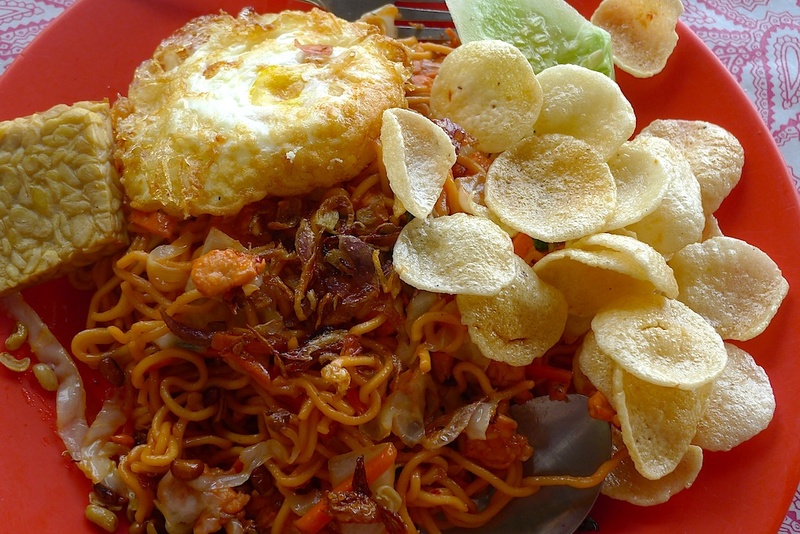 Then ordered a cold beer and a plate of freshly prepared nasi goreng – total cost about $3. I returned visit to the beach the day afterwards. Managed it in 27 minutes without even breaking into a sweat. It was a tad different. The sky clouded, the cloud base lowered to head height and lightening ripped through, biblical style. Thunder shook the area and torrential rain smashed into the beach, creating small rivers which then recycled it to the ocean. After the initial fright which caused everybody to retreat to the back row of tables a few mad buggers rushed out onto the beach and started to hug each other. They were all washed out to sea so I finished their beers which was the most charitable thing to come to my mind. An outbreak of hugs during a tropical storm. Should I offer an apology? May be I should but I haven’t. In any event I doubt that too many people will be losing much sleep over it. 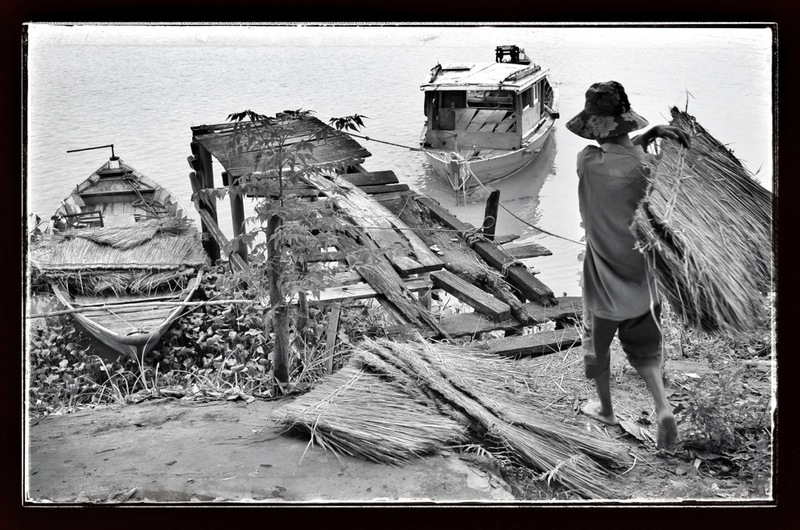 The truth is I said I would post Part II of the Mekong Delta story: Travelling with Dragons. In the event I ran out of time to complete that and decided to take a backlog of work to Bali, find a cheap hotel and catch up with ‘stuff’ – basically unfinished stories. For readers who don’t know Fremantle, where I live, you may consider that it’s rather extravagant to hop on a plane to Bali. 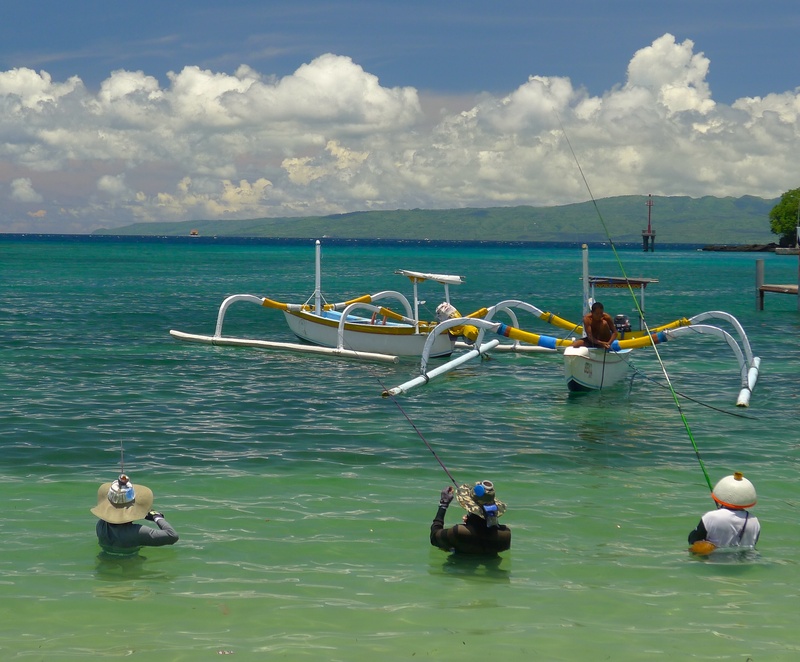 In fact it is quicker (that’s stretching a point a little) and a lot cheaper (that’s not stretching a point) for me to go to Bali than to go to next nearest place of note. . It’s a three hour drive to our nearest resort region and it’s very expensive territory. Thus I find it easy to slip into Bali, not quite a commute but it’s getting like that. Thus, decision made, I fronted up in the small coastal town of Padang Bai in the middle of a tropical downpour which delighted me as I hadn’t experienced real rain for about a year. It was well after sunset and, as I like travelling with no prior hotel bookings, I lobbed into the first place I found. Marco Inn is tiny, about eight rooms, and right on the waterfront of Padang Bai. 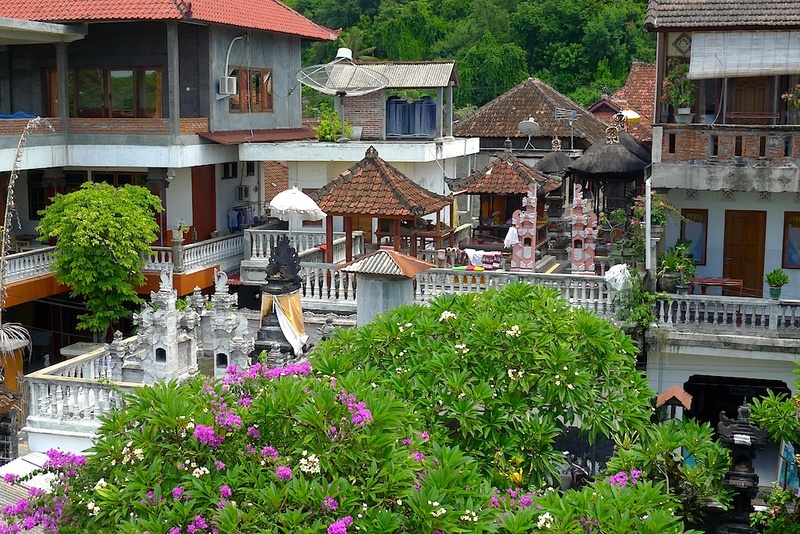 Like may of these small hotels it is situated down a narrow alley which is wedged between a shop on one side, which sells many wooden carvings, and a warung which sells icy beer, fresh fruit juices and snacks. 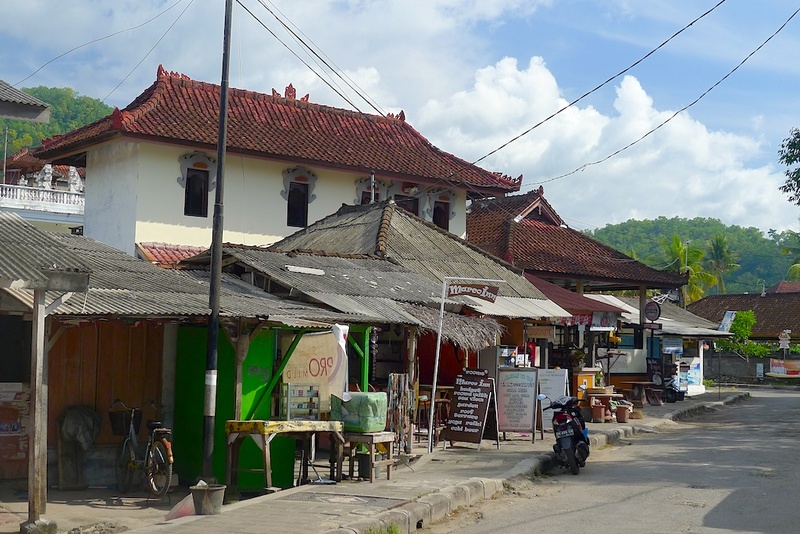 This is the main drag, over the road from the beach, in Padang Bai. If you look carefully you’ll see the Marco Inn sign. The hotel is down a small alleyway leading into a jasmin scented courtyard. A room was available on the first floor and had all I wished for – it was clean, there was a shower, toilet, fan, a small desk and a cupboard. It was not five star, more like a monk’s cell. Even in the damp climate of the wet season it smelt fresh and when the sun rose, summoned by roosters crowing, dogs barking and the booming horns of ferries I was able to look out over rooftops to the harbour. Perfect. Even better it was nine dollars a night which included breakfast. Like many visitors to the island I am totally addicted to banana pancakes for breakfast. That and a heart starter of Balinese style coffee – somewhere between Greek and Vietnamese – sets me up for the morning. Breakfast was taken in a small frangipani scented courtyard with blooming pink Bougainvillea. And to round it off my banana pancake was served by an attractive and chatty Balinese woman named Jasmin. 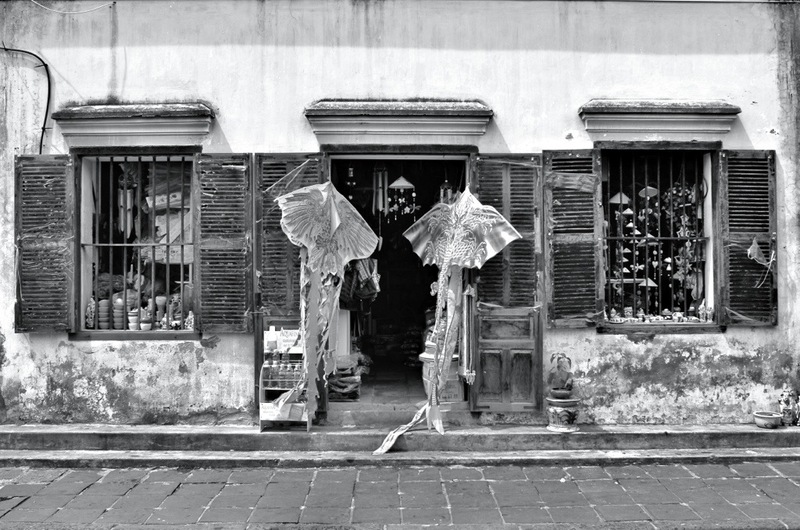 In the middle of the courtyard yard is a small structure, call it a family temple, and the day’s offerings to the Balinese gods and spirits were already sitting beside small statues. Sandalwood incense sticks were slowly burning and tiny columns of blue smoke mingled with the frangipani’s aroma. You may have guessed that these days I don’t like to work under pressure. Opposite the hotel is the main beach where local fishermen make an early catch and deliver fish straight to restaurants along the waterfronts. 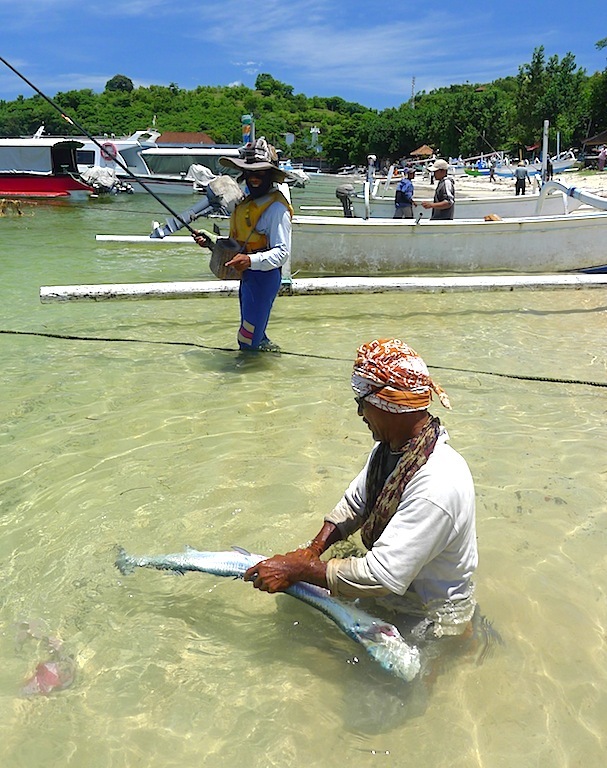 Freshly caught fish are cooked in restaurants less than a minutes walk away. I specialise in travelling light. So much so I even lecture in the practice. My total baggage weighed a little over 8kilos – about 17-18 pounds. I travel with an iPad, a keyboard, a Leica D Lux 5, a few cards for the camera, notebook, pens and pencils, about five T-shirts, three pairs of shorts and bits – shaving gear etc. I carry this onboard as hand baggage. (TIP: Jetstar allow 10kg of hand baggage). I book a seat up front in the plane and am invariably in the first half-dozen passengers through immigration. But this trip was going to be full of surprises so tune in tomorrow …. or the day after, I’ll see how I go. And I will finish the Dragon’s Tale soon as possible.